Another nice Nomad Dan ! Thanks for sharing yours & Andys' thoughts / emails on your recent posts too. Incidently what is your 'S' measurement for your saddle height? S=937mm/36.9in (distance from top of pedal to top of saddle measured along seat tube with crank inline with seat tube). R=515mm/20.3in (tip of saddle through centerline of handlebar grips -- straight tops of drop 'bars, in my case). H=0 (tops of 'bars level with top of saddle). B=82mm/3.2in (Distance of plumb line behind BB, from saddle; reason for my long layback seatpost to clamp the Brooks in the center of the rails, helping prevent rail fracture on really rough roads). 1803mm = 71in or 5'11", my height. Don't worry if you miss something, Matt; I often develop selective blindness when looking at something that interests me! If you want or need any specific photos or specs, just give a shout. JimG, the little neighbor kid saw me riding the bike in my black cycling tights when it was chilly the other morning. Now he keeps asking where I keep the cape and mask, and figures they are in the Ortlieb underseat bag. I...eh, I'm not sure I should spoil the dream. I thought about riding by with my black balaclava as well. Thank goodness it isn't the Spiderman Bike. That would be harder to pull off. Andrew, the comfort bars look a very good choice indeed! Oh, how I struggled for a way to use that pump; thank goodness I was sent the "wrong" Doohicki on one order...it proved exactly right for this application! Zefal have a solution for you, as well, in the Doodad: http://www.zefal.com/en/other-accessories/146-doodad-.html It is nearly identical to the TwoFish LockBlock: http://www.twofish.biz/bike.html I think "Ghengis" is a terrific name for your Nomad! Right in keeping with Adventure! I have some plans for the mudguard decorations I think you will really like...stay tuned for updates! JimK, yes! The Rohloff really *is* the business (and a whole lot of fun)! Lots to tell there in future episodes. Andre, couldn't have done it without you! And...I wouldn't cut that steerer for anything! Jags, yes! Super glue is the key to keeping "Mudguard Mascots" in place. That and a straight pin or slim, flat-headed nail through the center of the mascot, also coated with glue. Sure appreciate your support. Hahahaha! It surely is, Pete, it surely is! What happens to the Sherpa now? How will you decide which one to ride? Your drop handlebars look like they are tilted quite far upwards. Do you like them like that? I have found that when I do that it's difficult to use the drops. I have now however discovered short reach drops with nice flat tops and rounded shallow drops that I don't have to tilt back as much. My new ones are salsa cowbell. These have drops that stick out a bit, which are nice. The drops sweep back quite far though so I had to chop a bit off the ends to avoid hitting my knees on the bar end shifters! Nice hearing from you; you've made some good observations and ask great questions! Tomorrow or the next day, Sherpa will be shipped back to Thorn for analysis to see what might have caused the problem. As Andre mentioned in the thread about it, it is entirely possible we may never know the root cause if it is internal to the tubes or some flaw related to uneven heat-treatment or such that is invisible. Thorn have stood squarely behind their warranty and done the most fantastic job of customer service ever when the completely unforeseen occurred. I have never once heard of a similar problem among Thorns of any model, so it is that much more evidence something was awry with this one sample. It can happen in any production process. So, the question of which to ride will be easy -- the Nomad will be the only one left Stateside. Yes, my drop handlebars are tilted quite far upwards, but not as much as it would appear! The tops are, in fact, level with the ground, and the bend of the 'bars is such they appear higher when viewed from the side. At 44cm, these are the same width as I use to captain my tandem, but those are Nitto B115 'bars with the bend in the drops parallel to the tops and so look far more conventional in profile even though the tops are also level. There is a method to my madness on the Nomad...I prefer my back and arms to each be at a 45° angle to the ground while atop the brake hoods, so having the hoods at about the same angle works well for me. That same 45°/45° placement also ensures about equal weight on my seat and hands, and works well for me on 17-hour days in the saddle. Contrary to what one might think (and I would otherwise include myself among the skeptics), the bend of the Zoom anatomic 'bars makes it easy to reach the brake levers from below. 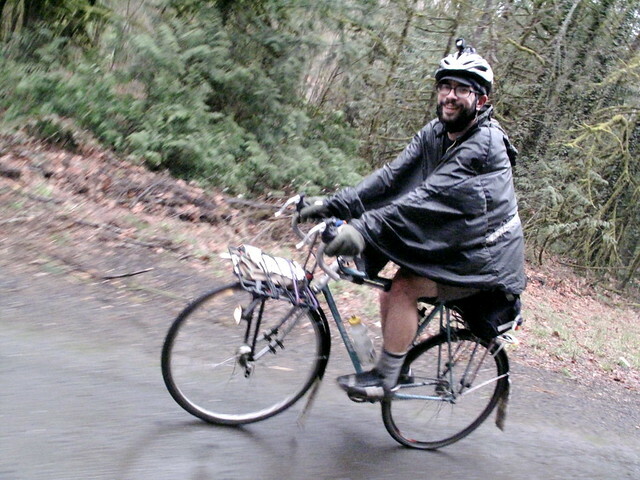 When I go to the drops, I usually ride with "knees inside my elbows" and a very flat back in the old roadie tradition. This puts my arms in a position to grab the levers directly from the rear and it all works out. I've attached a profile photo of my tandem so you can see what a big difference the handlebar bend makes to the apparent angle and how one approaches the brake levers. On the tandem, the captain's 'bars are 44cm wide (Nitto B115). The drop "return" is roughly parallel to the tops. The tops are parallel to the ground, or very nearly so (camera angle causes some distortion). Now, take a look at the stoker's handlebars. They're a Trek System 6 'bar, 46cm wide (wider so the stoker's hands will clear my bottom when the adjustable stoker stem I milled, mitered, and brazed-together is far-forward; the bike has to accommodate a variety of stokers from small to tall). There's no brake levers for the stoker, just dummy grips to serve as hand rests. The stoker's 'bars are tilted up a wee bit per that day's stoker's preference, but the tops are still pretty close to level with the ground. Ah! But look at the angle of the stoker's drops compared to the captain's. They look tilted way upward when, in fact, it is the lower return angle on the drops that is different. This is roughly the situation I face with the Zoom Anatomic handlebars on the Nomad. The hooks (drops) "open" as they progress toward the end of the 'bars...even though the tops are still parallel to the ground. All have the tops parallel to the ground, and the levers are set up at close to a 45° angle, but the blue rando bike uses Nitto Randonneur handlebars with a really shallow parallel drop, and is 45cm (!) at the ends and (yikes!) only 37cm wide at the brake hoods (these 'bars flare from the hoods to the hooks; no wonder the 44cm anatomic bend of the Zooms seems wide to me!). Still, they "look" more "down" than the Zoom Anatomics on the Sherpa and Nomad. Whew! It's a wild world when it comes to finding handlebars that will work, and not every 'bar works with every bike. One concern I had with Sherpa and the Nomad related to the sloping top tubes. To prevent the possible tragedy of a dinged top tube in the event of a fall (especially when fully-loaded and on-tour), I wanted the end of the handlebar to clear the top tube at full steering lock. Well, the "open" hook of the Zooms provides just enough clearance so they pass the underside of the top tube -- by a millimeter or so, but they clear. Jane, you did really well to get the Salsa Cowbells to work for you, and shortening them for use with bar-ends is just part-and-parcel of getting the "right" handlebar for your needs and application. Well done! Yes, I realize my current setup looks a bit um..."odd"? er, "special"? but it works for me, and surprisingly well. It has surprised me, anyway! I kinda wish it looked more conventional, but I have concluded function trumps all aesthetic concerns when it comes to getting the best tool for my needs. If it causes negative comment from others (as it did yesterday on a longer ride), well...perhaps that will reduce the theft potential. Good questions! Glad you asked! More are welcome! Didn't realise the Sherpa was going back. Incidentally my Sherpa has to go back for a re spray soon, as the paint has crumbled in a lot of places on the frame. I see what you mean about the handlebars. I find it a bit of a nuisance when you have to rotate handlebars like that to get the tops flat. On the Salsa bars, if you put the brakes too high it's hard to reach them when you are on the drops. I am usually not too bothered if I can use the drops, but when I am pulling the tag along I need good brakes so the drops are better. I find the Salsa bars really comfortable, but if paths get a bit rough I think having drops is not ideal when pulling the tag along (and when riding alone but not as bad!). Having them wider may help (they are 42cm wide), but I get sore shoulders if they are too wide. Loving your excellent grammar and spelling and I apologise for not capitalising Salsa Cowbell! I see that you know the bungee cord trick to keep the toe clips upright! Nice. Its always good to see a different take on the standard format of handlebar layout. Thought you might even have been tempted by the 2 handlebar approach that sheldon brown tried. Did you get the tandem red enough for your liking ? Um...no. Some spilled over and got the car. Some of you have asked if it is still possible for me to get a classic roadie's flat-back, "knees-inside-the-elbows" position on the Nomad Mk2 with the 'bars and levers placed so high. I can hold this position for a good 100km at a time into headwinds, and have done most of my touring along the Netherlands' North Sea into strong headwinds using the same position on my old Miyata 1000LT and on my rando bike stateside during my 300-400km rides when headwinds became problematic. It is as comfortable in this low position on the Nomad as it is on the other bikes, and I usually do so with straight wrists and hands set just a smidge higher, unlike in this photo (getting good cycling profile shots is a trial-and-error process and I wasn't fully into position here). So, for those wondering, it is indeed possible to get a full range of road positions from relaxed touring to go-fast with drop handlebars on a Nomad Mk2. No too far off the position taken by Robert "Pineapple Bob" Kurosawa in the 1991 Bridgestone catalog (pg. 31). It is harvest time here in Oregon's southern Willamette Valley, and the days are just lovely -- cool, crisp nights with temps as low as 41F/5C and daytime highs of 81F/27C with lots of sunshine and a cool undercurrent that keeps it from feeling too hot. The farmers are putting up their hay, and I can't think of a better time to get out and make the rounds of the farm stalls to buy fresh sweet corn, green beans, cucumbers, and watermelon. The very best of "summer", right between one's teeth! Of course, the best way to go is on a bicycle, so I took the Nomad out and we had a grand time. Attached is a photo of him posed in a farmer's field, next to a stack of hay bales. Being very quiet, I could hear the little field mice in the bales and so could the large hawk perched atop the stack; I saw him as I was leaving. Probably a good idea for the little mice to stay snug in the straw for now. This was the long Labor Day weekend here in the States, and this is typically regarded as the Last Hurrah for summer. This week, school will start, and life changes -- though the calendar says it is still awhile until Fall, it is the de factor end of summer as a time for vacations and holidays for most people. It was also a weekend of labor for me. In between taking down much of an overgrown pear tree using a hand chain saw (a chainsaw chain, and a pair of handles...touring training! ), I did some work on the Nomad. On thing I did was apply the Tuareg nomad logo on the rear fender, done in black Scotchlite reflective tape. It looks black -- like the fender -- until it is struck by car headlights or sunlight. Then, it reflects the source light and glows gold in color. The symbol is used by my ADV club and is also the official logo of the old Paris-Dakar car and motorcycle race (rally-raid) across the desert. When terrorism forced a change of venue to Argentina and Chile, the logo came along with the race. The Tuareg are regarded worldwide as the definitive desert nomads, and the logo showing the Tuaref in his Tagelmust veil is intended as a respectful homage to the Tuareg people and their nomadic lifestyle. These are the Blue People of the desert, so-called because the indigo used to dye their veils often turns their skin blue as well -- sometimes permanently. It seemed appropriate where the bike is a Nomad and will spend so much time rambling around the desert with me. The logo is a stylized representation and if you look carefully, it helps spell the bike's official name in pictograms: Thorn (head badge), Raven (the Playmobil toy on the front fender) Nomad (Tuareg decal on the rear fender) -- Thorn-Raven-Nomad. The Tuareg matches the embroidered patch that will go on my rear pannier. I have found it very helpful to mark the rear side of my bags (rear, so brush won't tear the patches) so I can orient them quickly on the racks and so I can identify what is in them (all the patches are different, but the bags are identical and can go on the wrong way if I don't have them marked in some manner). I don't sew the patches, as the needle holes could cause leaks. Instead, I use SeamGrip to glue them on. SeamGrip is really strong and durable; I just clamp the patches in place overnight to hold them while the glue cures. I got a bit more done, and will cover that in the next installment. The busy weekend of Nomad refinement continued with a task I've put off long enough...I finally got around to using an acrylic paint pen to put my name on all my panniers and handlebar bag. The paint pen is a bit like a felt-tip marker, but filled with acrylic paint instead of ink, and it dries to a permanent finish. name on the wheel side, where it can be seen if needed, but won't be noticed by a casual passerby. The handlebar bag is labeled on the underside. paint had to be built up in three applications, layer by layer. I also added a second stabilizer fin to the front bags so they match the rear panniers. These really make a difference in reducing vibration, and now the bags pretty much lock onto the racks. I also use compression straps on each pannier. The rear bags have a second set of mounting hooks because they weigh more, and also because it is a handy place to store them for emergency use in case I fall and one breaks or gets ripped off its mounts. A positive side-effect of the double fins and hooks is it would be harder to steal the bags, and it is only a tiny bit less convenient for me to mount and remove them, so it is working out well. It added very little weight. I drilled-out the rivets holding the original SKS "flip" mudflap at the end of the front fender and attached the shorter of my two Buddy Flaps with aluminum rivets and backing plates. This will go far toward preventing mud, dust, and dirt from splashing onto my feet and the crankset. It is flexible, 3mm thick vinyl and will not break or damage the fender - it bends easily if it strikes an obstacle. I am thinking seriously of putting a rear fender on the front and cutting off the front of it inline with the diagonal stay on my Low-Loader front rack. It would greatly help in wet winter weather, and would add very little weight. I did this on one of my Centurions and could not believe how much drier I was! The current SKS Nomad fender ends at 90°, and when it is wet, the water shoots straight ahead...and then I ride directly into it. If the fender curves downward in front, the water is channeled downward as well, and drips *down* off the end and is not blown back on me as directly. The longer fender allows the water to lose a little velocity by the time it exits, too. Everything stays cleaner, including the bags. I have attached a photo of my 1980 Centurion ProTour so you can see what I am considering for the Nomad. Yes, it looks a little strange, but all the top custom-made French touring bikes of the 1940s, 1950s, and 1960s, by Alex Singer and Rene Herse had similar fenders (mudguards) for this very reason -- they worked so much better! I am in the early stages in pondering this, but I think it can be made to look nice. It will require another rear fender and stays and an extra bridge and fender stay to attach to the corner of the front racks using slightly longer bolts. Last project of this long weekend was installing the Planet Bike Protege 9.0 bike computer on the same 55mm T-bar that carries the handlebar bag mount. I very much wanted the installation to look "clean" and neat, because all the wires and cable on the Nomad already look very trim and tidy, thanks to Andy Blance's frequent cable guides. The thing that gave me the most trouble was the sensor. It needed to be within 25mm-50mm of the hub axle, but the brazed-on boss for the fender mount was in the way. Also, the sensor is supposed to be 1-2mm from the magnet, and I think I tried every combination imaginable to achieve the needed clearances. After looking closely at the wheel, I decided to mount the magnet on a spoke that crossed "under" the others, and that exactly provided the needed clearance. I had hoped to mount the sensor on the backside of the fork to protect it from impacts, but this wasn't possible due to interferene with the fender braze-on. The sensor is pretty well sheltered from harm by the Low-Loader front racks and the panniers. I ran the cable along the inside of the fork and behind the brake bosses, then secured it just below the crown and "jumped the gap" to the front brake cable, fastening it with three cable ties before "jumping back" to the T-bar where I mounted the computer. The sightlines are just right so I can simply look down and get an unobstructed view of the computer andit is nice to have it a little farther away so it remains clear despite presbyopia. Because this computer has no buttons, I don't have to worry about being able to reach them (the case slides ahead in its mount to change modes or reset data). This computer has been perfect for my needs except it calculates average speeds on a 10-hour base. Beyond 10 hours, the computer still works and records distance, but shows an error for average speed. Something to keep in mind if you're considering the PB Protege 9.0. I have learned to live with this flaw since the rest of the computer works so well for me otherwise. The blank space to the left of the SkyMounti on the uppermost T-bar is reserved for the camera clamp with tilt-pan head that holds the GoPro for forward, angled, and turn-back interview-mode video capture.